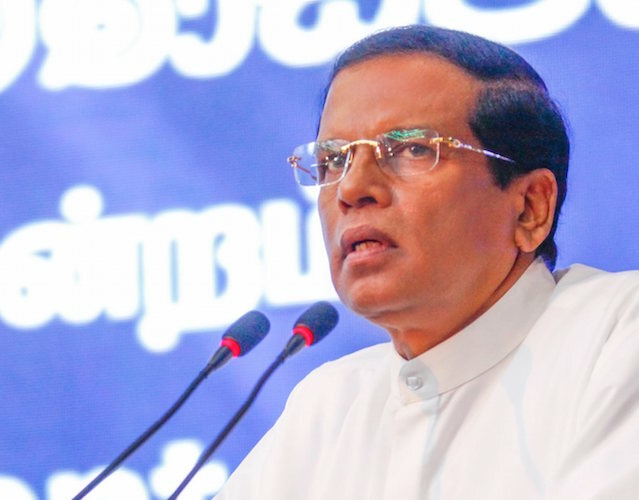 Mullaitivu, January 21 (newsin.asia): Sri Lankan President Maithripala Sirisena on Monday announced a toll free telephone number “1984” which people can call to lodge complaints about the drug menace in their area. The President made this announcement at an event held at the Vidyananda Maha Vidyalaya, Mulliyawalai, Mullaitivu, to inaugurate the National Drug Prevention Week. Sirisena declared that all decisions taken in the last four years to curb the drug menace will be implemented with new approach from the next week. He emphasized that the government will not change its decision to impose capital punishment on drug traffickers. President Sirisena said that the government of the Philippines has agreed to provide assistance to Sri Lanka to curb illegal drug smuggling and a Philippines expert team is scheduled to visit Sri Lanka shortly to explore the possibility of providing technological consultancy services in this regard. The Philippines was being destroyed due to rampant drug use but due to the initiatives taken by the President of Philippines Rodrigo Duterte, it has overcome this challenge, Sirisena said. He will not change the stern decisions taken against drug traffickers due to the fear of NGOs, the President added. Alluding to the large scale extra-judicial elimination of drug users and traffickers in the Philippines, the President said that he will not implement some of the decisions taken by the President of the Philippines. Certain human rights organizations raise their voices against hard decisions taken against drug dealers, but they should realize the damage caused to the country, the nation and the future of children by rampant drug use, Sirisena said. The President announced that information regarding drug dealers, and parties behind these dealers will be revealed to the country. The national drug prevention week will be observed till January 28. Special activities will be organized in schools from January 21 to 25. Parents, social and religious organizations and places of worship will all be used to educate the people on all aspects of the drug question including the legal framework applicable to it.